Didn’t find much to do or see here in the Batignolles in the first hour or so. Walked the major shopping drags, but didn’t see a lot of shops, and most of them were closed for August. But I stopped at this adorable little cafe. Flawless selection of classic American songs playing. Etta James, Al Green, Staple Singers, etc. Top-notch eclectic Paris flea market decor. 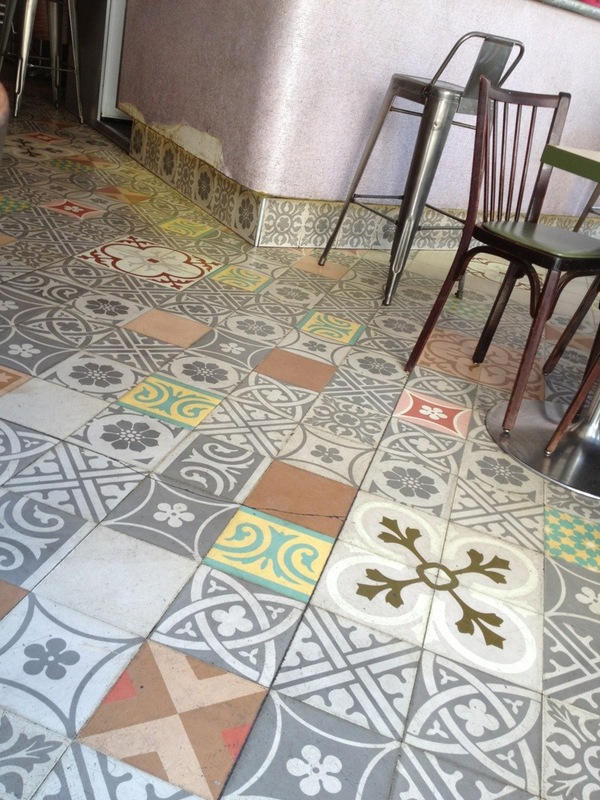 Food is cheap and good, plus a nice range of drinks, coffees and desserts, along with the coolest floor in Paris. And wifi that works! At the corner of Rue Lemercier and Rue Legendre. If you’re out in the 17th, stop in at Sans Gêne. Tab for a sandwich and a Coke: 8.50E. As I recall, most of the cocktails were around 5-6E.